It is 50 years since the first ever manned space mission (12 April 1961) and as the Shuttle makes its final flights before retirement later this year, Haynes has produced a manual for the NASA Space Shuttle. This remarkable machine – part spacecraft, part glider – is the world’s first re-usable space craft, designed not only to conquer the final frontier, but to make it a part of the human realm. 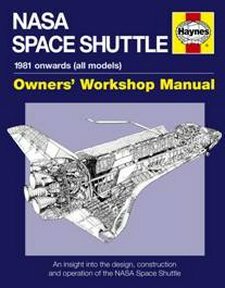 Author Dr David Baker, who worked with NASA for 25 years, has given the Shuttle the classic Haynes Manual treatment in a new book published to mark the 30th anniversary of its first mission (12 April 1981). The NASA Space Shuttle Owners’ Workshop Manual includes the full story of the Shuttle, its design, construction and operation, supported by more than 250 photographs, technical diagrams and explanations. Published to mark the 30th anniversary of the Shuttle’s first mission (12 April 1981), the book also outlines the historical context of this ingenious creation – part spacecraft, part glider, designed not only to conquer the final frontier, but to make it a part of the human realm. The USA’s Shuttle programme was the one Cold War space project that forged an inseparable link with the giant Russian space programme after the collapse of communism. These global superpowers came together for the first time, uniting in their dream to make routine space travel a reality. At its peak more than 50,000 people were working on the Shuttle programme. Changes in political and financial courses through the spacecraft’s 30-year journey, along with two tragic losses of craft and crew, have seen the Shuttle and the organisation that created it significantly change direction, all of which is chronicled in this manual. The Shuttle’s internal layout and systems are explained in full including the operation of life support, electrical power production, cooling, propulsion, flight control, communications, landing and avionics.